In our state, local farm profits depend on finding sufficient demand during seasonal “market windows,” at decent prices. Getting a foot in the door at supermarket retailers can be brutal; it’s more convenient for retailers to work with big suppliers with their lowest cost, year-round availability of products rather than contract with multiple seasonal growers asking for dignity pricing. But what happens when a selling phrase like local becomes so enticing that retailers begin to label non-New Jersey products as local in our local stores? The words consumer fraud come to mind. Last season, retired Gloucester County Ag Agent Jerry Frecon happened across a retailer advertising “Locally Grown Peaches;” Does South Carolina feel local to you? What’s the consensus on the common definition of local? Do most people agree that local means nearby? Consumers, Growers, and Retailers may differ in their opinions. While we may view nearby states, Vermont and Maryland, as local to our region, when it comes to farm products “local” may not be perceived in a similar way. The state legislatures of Vermont and Maryland have adopted differing approaches to regulation of the “local” label. Vermont 2007 Consumer Protection Statute 2465a – Farm products may bear the label “local” if they “originated within Vermont or 30 miles of the place where they are sold,” as the crow flies. You won’t find any New Jersey farm products labeled “local” in Vermont. Maryland 2010 Act (Bill 421) – The Act did not specifically define “local” but instead left that thorny issue up to the Maryland Department of Agriculture and stakeholder groups. The outcome was essentially a truth in labeling law, similar to the hotly contested federal proposal, Country of Origin Labeling (COOL). Maryland’s law requires that if “local” is used in point of sale advertising, signage must also include the state or location of origin. The law does not apply to billboards, magazines, and radio ads. If produce grew on Mars, it would be legal to label your Mars lettuce as local on a Maryland billboard. On the up side, defining local as “nearby” is good for consumers (they feel good having an honest relationship with the seller; the public is informed as to where their food comes from), and good for local farms (they benefit from the customer’s desire to eat food locally grown or raised). The down side is, that for growers who ship their products to distant markets, the product should not be labeled “local.” That’s a bigger deal than you might think. 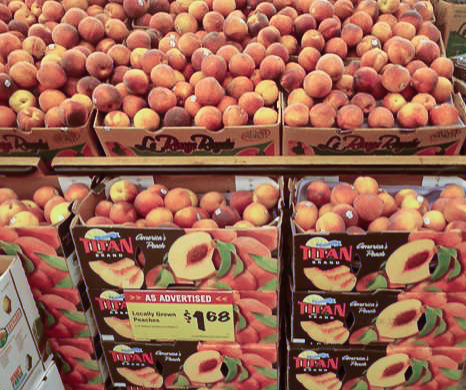 There has been an incident where produce was rejected by another state due to labeling. You can’t have your cake and eat it too. When the farm products do not originate in New Jersey, the standard is denoted by “local to,” “locally grown in,” or “locally produced in,” the identified locality, and state of origin. Intended to help inform consumers of desirable, New Jersey grown farm products, and guard against unethical competition for our local farms, this proposed rule will have the opposite effect. Understandably the political economy of NJ farming is complex, but in codifying the misuse of the local label, we further the decline of ag-in-the-middle farms. In our minds the answer is clear, the term local should apply to farm products that are produced nearby; if the product does not meet that criteria, don’t label it local. Whatever your feelings about the issue, make your voice heard: call or write your NJ Department of Ag leaders before July 3, 2015. Local Farm Products, Proposed New Rules: N.J.A.C. 2:71-10. NJ Register, May 4, 2015. Safire, William. “Locavorism.” The New York Times. The New York Times, 11 Oct. 2008. Web. 22 May 2015. “Fairness.” Red Tomato. Web. 23 May 2015.